Want to find out about the internet speeds and performance on your ADSL connection? Have you ever wondered what the real speed you’re getting on your ADSL line is? Do you want to know how your broadband performance changes over time? Do you want to contribute to a data set about the quality of broadband speeds in the Western Cape Province and in Africa? Participate in our research study by hosting a BISmark router in your existing ADSL router. All data collected will remain anonymous but will be used to build up a profile of ADSL performance in the Western Cape and subsequently in Africa, that will be made publicly available and used in the Western Cape Province study on broadband impact assessment. Research ICT Africa and UCT are conducting a study in collaboration with the Western Cape Province and Georgia Institute of Technology to measure the quality of broadband services in the Western Cape Province. Our goal is to benchmark current ADSL speeds and to ascertain whether customers are getting what they pay for and if speeds are adequate for commonly used Internet applications such as web browsing, video, VoIP, email, and voice chat. 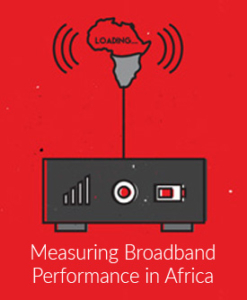 Collecting this data will enable us to make evidence-based policy recommendations for mobile broadband in Africa. You can help us by taking part in the study. You’re eligible for the study if you have an ADSL line. You will keep the BISmark Wifi Router and Your data will help us learn about broadband speeds and performance in Africa. Please send an email to broadbandstudy@researchictafrica.net with your detais (Name, Surname, Cell no.). We will contact you back with further instructions on how to install the BISmark router.